Sometimes, there is room for a Dutch roundabout, but there’s a little too much traffic. This is most likely to be a problem if morning peak traffic is concentrated on one arm of the roundabout. In this situation it is sometimes possible to handle the excess traffic using a bypass lane. This is a sketch design for a roundabout in Bedford, which has recently been proposed for conversion to a Dutch “turbo” design, but without cycle tracks. 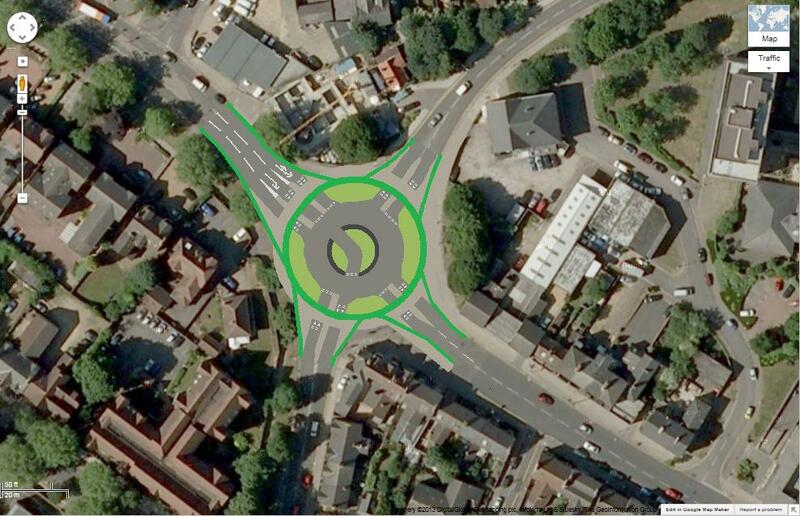 This sketch design provides an extra lane from the busiest arm, in this case going through the centre of the roundabout. Unlike the “turbo” design, cyclists can negotiate this roundabout without needing to pull out into the right-hand lane, or switch to the pavement. This design is experimental; if the lane through the centre doesn’t work, the junction will need to be converted to traffic-lights, if it is to be cycle-friendly.